The Tern has been moored in it's new home, the Edgartown harbor, as of yesterday afternoon after a 24 mile shake down cruise from Bucky Barlows. The trip truly wasn't long enough, although it was full of smiles and strong winds. My family and I look forward to further restoration of the Tern and many overnight sailing trips up and down the coast. ps Many, many thanks to Fred Balfour. There were many stars aligned for my family and I during the purchase of the Tern, none more of an influence than hearing the confidence and experience Fred shared with me about the Tern. I can’t thank Fred enough for answering the many questions I had before the purchase, even more after committing to the purchase. I look forward to meeting Fred on deck, and in person, when he visits the Vineyard this August. 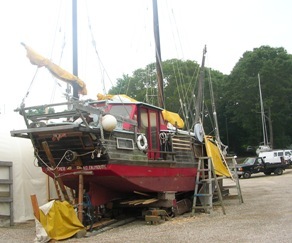 On July 17, 2011 Fred advised that Tern had been sold to Adam Hayes of Oak Bluffs, Massachusetts. We thank Fred for taking good care of her. Webmaster Note: Tern's new name is Resilience. Click here to go to her page. The following is Tern's story up to this point. April 4, 2011 Here is the note Fred sent in and his updated CraigsList ad. Tern is ready to launch. You can see the Tern any day this spring on the stands in Bucky Barlow’s boat yard in Pocasset, near Monument Beach on Cape Cod. This Sparkman & Stephens classic will provide many years of low cost sailing enjoyment. Full EPA compliant head (toilet), Yanmar diesel, sails, bedding, dishes, silverware, ground tackle, everything we needed. See pictures at end of list or on this website: www.dolphin24.org/tern.html. Over 300 of these boats were built and over 250 are still in use. www.dolphin24.org/roster_name.html. And Why Are We Selling Tern? We’ve both passed 70 years of age over the past year. Between us we’ve got two knee replacements, a bad back, and 47 years of marriage that survived years of sailing on Tern and smaller boats. While we enjoy taking the grandkids out for day trips, our summers are now focused on our smaller day sailor (a New Haven Sharpie), hiking and biking, and chasing grandkids around the Museum of Science. The Tern needs to move on to someone with an eye towards more frequent use. Bow and stern pulpit, full life lines, self-storing stern swim ladder, and shoal draft keel means you can anchor up near the nicest beaches for lazy sun-filled days swimming, digging in the sand, and rowing about in the dinghy. 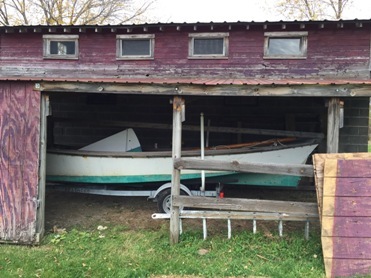 (Dinghy not included in base price). Two anchors with appropriate chain and line (CQR and Bruce), coast guard approved anchor lighting, two heavy duty 12 volt batteries (recently replaced), interior lights, an awning and a dodger mean that you can pull into remote and shallow coves and anchor securely, knowing that you’ve got the best gear for the job. Barbeque a steak, breakfast on eggs & bacon on the CNG two-burner stove, enjoy life! 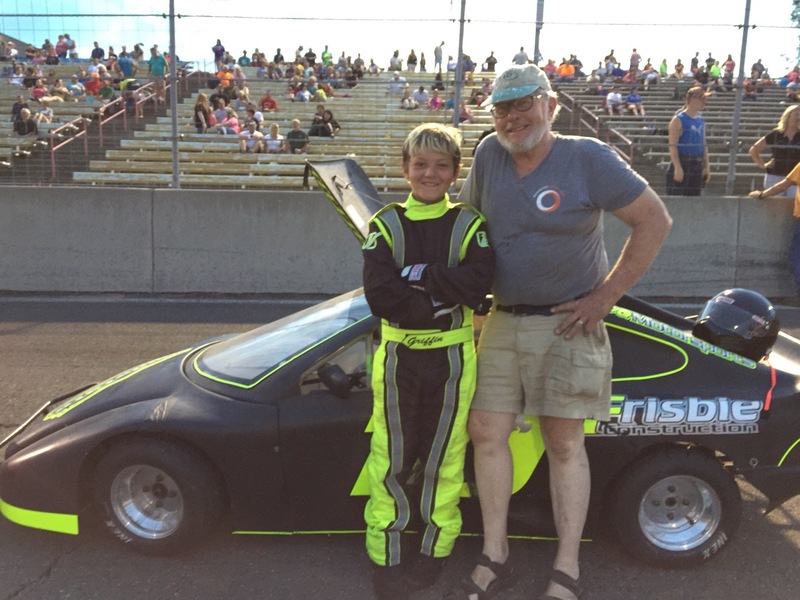 Originally designed by Bill Shaw at Sparkman and Stephens to excel in the MORC (Midget Ocean Racing Class) http://morcracing.org/index.html the first model won 27 consecutive races and became an instant favorite. Known for both its speed in light airs and good handling in heavy weather, it does well at all points of the compass. 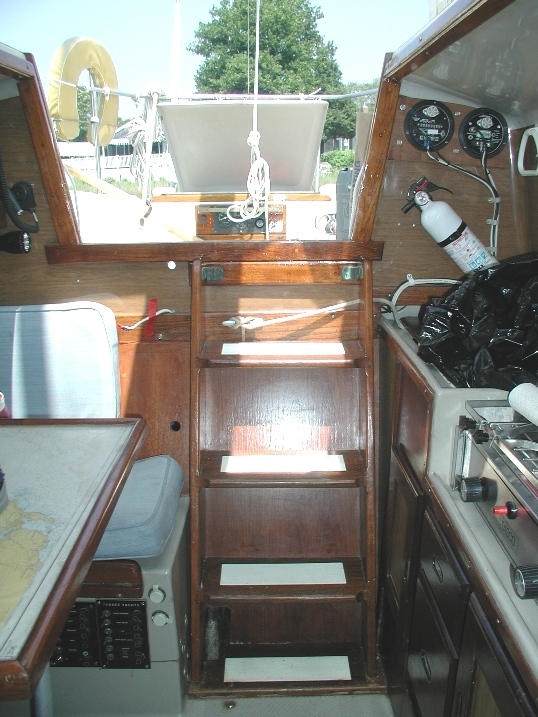 The full keel and keel-contained centerboard is well described in an article here: http://www.dolphin24.org/goodoldboat6pages.pdf. (If this article does not appear, email me and I'll send it. fred.balfour at gmail dot com). I also have a full survey from 2005 when I bought her in Vineyard Haven from a couple that were approaching 80 and had maintained her well. Sail a beautiful boat – classic lines. • Tankage: Fuel: 15 Gal. • Tankage: Water: 30 gal. • All through-hull seacocks working fine. Disclaimer: The owner offers the details of this vessel in good faith but cannot guarantee or warrant the accuracy of this information nor warrant the condition of the vessel. A buyer should instruct his agents, or his surveyors, to investigate such details as the buyer desires validated. This vessel is offered subject to prior sale, price change, or withdrawal without notice. The full size jib was showing some signs of sun-rot when we bought Tern in 2005. (It’s still available and usable to try out the full size.) A slightly smaller jib was included and I’ve been happy with the performance and never got around to buying a full size. Note that the smaller sail requires a 20-inch cable with swivel at top of jib luff attached to jib halyard. $7,000 on the stands. $8,000 if I launch and have it on a mooring. February 25, 2008. Fred checked in with Tern. 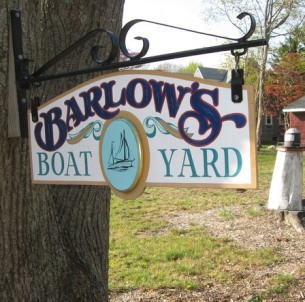 She is moored in the Pocasset River, Barlow's Boatyard, at the north end of Buzzards Bay. He tracked down some previous owner info and he forwarded the following information. 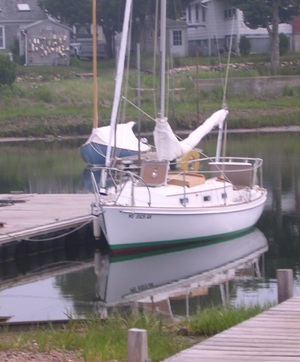 He bought Tern from Peter and Lisa DeRoetth in 2005 who had her moored at Vineyard Haven out on Martha's Vineyard. Other previous owners are Simeon Hyde and Albert Schaal. Fred reports the DeRoetths kept Tern in tip top condition and he has had only normal varnish work to keep her up, plus a new furling jib and dodger. The main hatch wood bonnet above looks like a non standard extra (Webmaster note: Simeon also promises more info about this), and probably doubled the standard Yankee varnish budget - worth it. She has a 1 cyl Yanmar diesel installed in 1994 - more about this project coming. If you looked carefully at the photo to the left you will note a raised rub rail, a first such feature seen on a Dolphin by your webmaster. 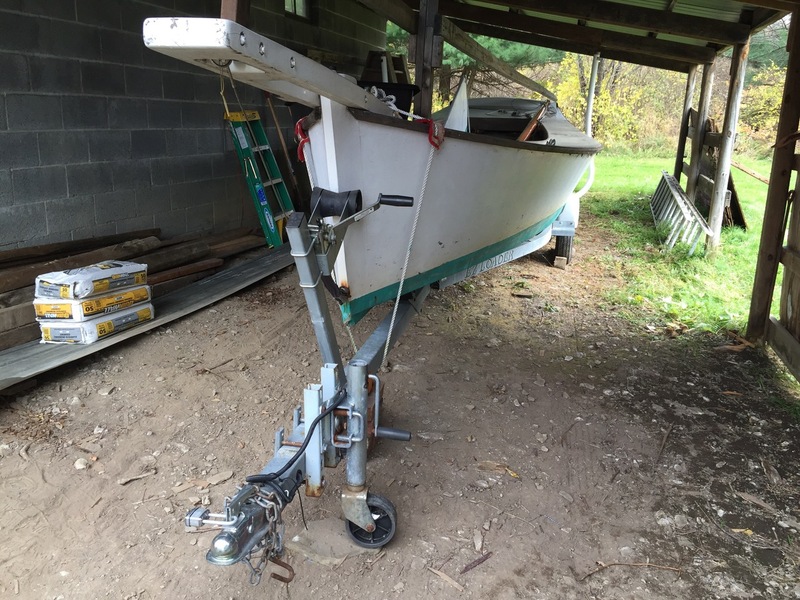 Tern originally was powered by an outboard in the transom well, and in 1994 was repowered with a Yanmar single cylinder diesel. Repowering from an outboard to an inboard has come up several times before and this is an opportunity, with Fred's help, to look at this in depth. Below is a picture of Tern's interior looking aft with the the inboard hiding in its expected location. We have a link to the website's Technical Section where most of this repowering subject will be developed, and where you get to see what's behind the panel below. Click here to go to it. On June 21, 2008 Your webmaster's Marionette stopped in Pocasset at the top of Buzzards Bay on her trip to Maine, and naturally, to visit with Tern. Fred was hard at work sanding that main hatch. We got a chance to tour around the small but interesting Barlow Boatyard where they still build wood boats and launch and retrieve boats on a marine railway. You can just see that railway at the lower left corner of the above left picture. This schooner barge occupied a prime location. I have just taken a first look at the website and I am trying to pin down the period of my ownership. 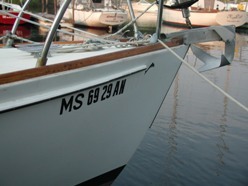 I find I bought her in the fall of 1984, through a broker, from a Mr.Doucette, who was buying a Tartan 27. I had her trucked from Great Bay(?) 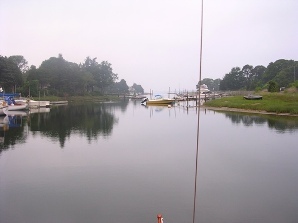 New Hampshire, to her new home port at Martha's Vineyard. 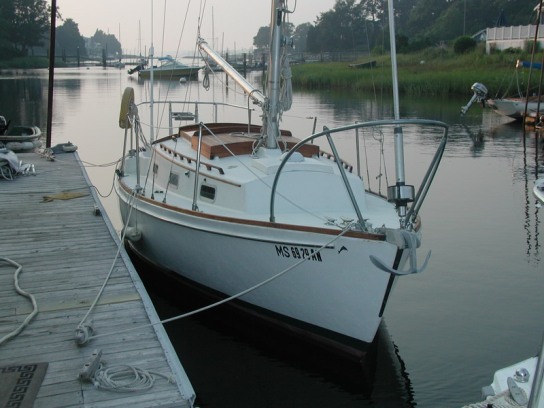 We cruised Down east in '85, wintered her over, and brought her back to the Vineyard the following summer. I then got rid of the clumsy ratlines, straightened up the raked mast, restoring her closer to true Dolphinhood. I did not remove the sea hood, which still exists, nor did I varnish it. (I left all the teak the natural gray, as was common in those days.) I do not remember the rub rail, which might have been consistent with the other modifications and suppose it to be a later addition. After summers of cruising south of the Cape, I sold her to a friend, Howard Eddy, who had substantial refitting done at M.V,. Shipyard. Your 1994 dating of the Diesel installation is somewhat puzzling, as I had thought the refit was done soon after the sale. Howard may have sailed her as he found her for longer than I realized. I saw her once, looking beautiful, after he told me he had sold her to a young couple. I do remember my dismay when Howard told me he had sold Tern because he had found her too tender. He was an old salt whose youthful experience included sailing before the mast on one of the "P" ships in the last grain race to and from Australia, but his wife was not comfortable on "tippy" boats. His disappointment may have been brought about by my having replaced the rusted iron center board with an insufficiently weighted one of structural fiberglass. I had had little opportunity to test. 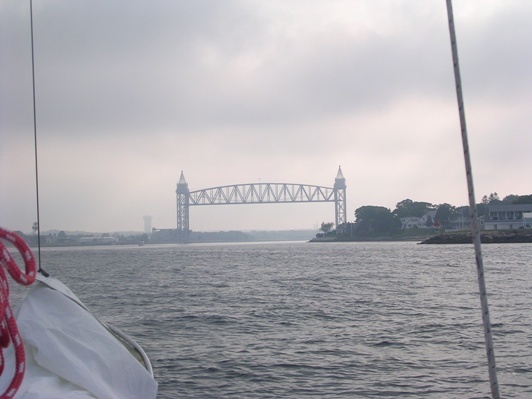 (I do remember, on the sea trial with Howard, deciding to ease her with a reef as we beat up Vineyard Haven in a typical Vineyard Sound sou'wester. "...I disposed of the old style wire luff furling jib (Schaefer ? ), which I could not carry upwind successfully and was miserable when partially furled. I got satisfying performance with a lapper, non-lapping working jib, an storm handkerchief, used only once with a double reefed main. Lying to in a storm works well with a Dolphin"
Good to hear from you. Thanks for the note that I am a "lifetime privilege" member on the website. 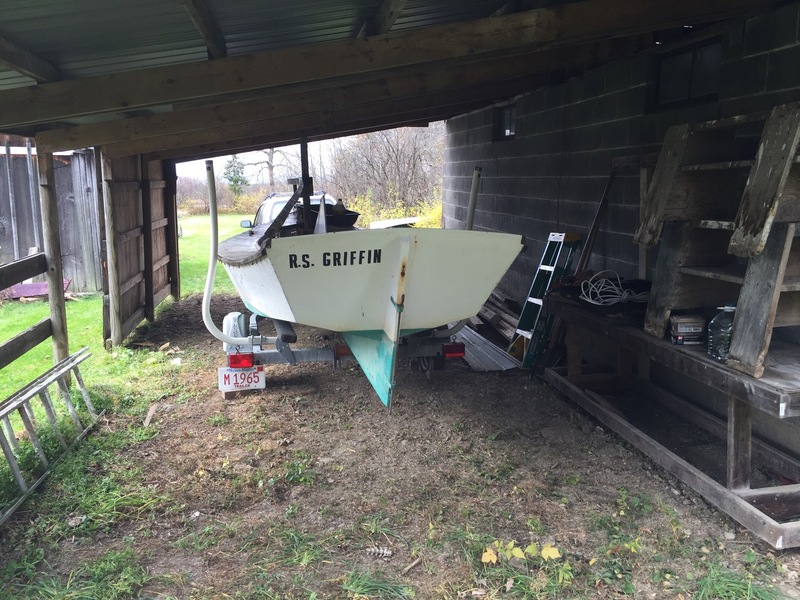 Re: hull number, I searched the Tern quite a while and could not find one so I assumed that a previous owner replaced or sanded over the hull number location on the Tern. Re: why I picked 1972. I don't remember exactly but, given that I couldn't find the hull number, I believe I made some assumptions based on previous owner information. What am I up to? Well, we sold the Tern in 2010 or so since we were spending half time in Ithaca New York with one set of grandkids and half-time in Boston with the other set. That meant two weeks in one place two weeks and the other days traveling between - six hour trips a month. 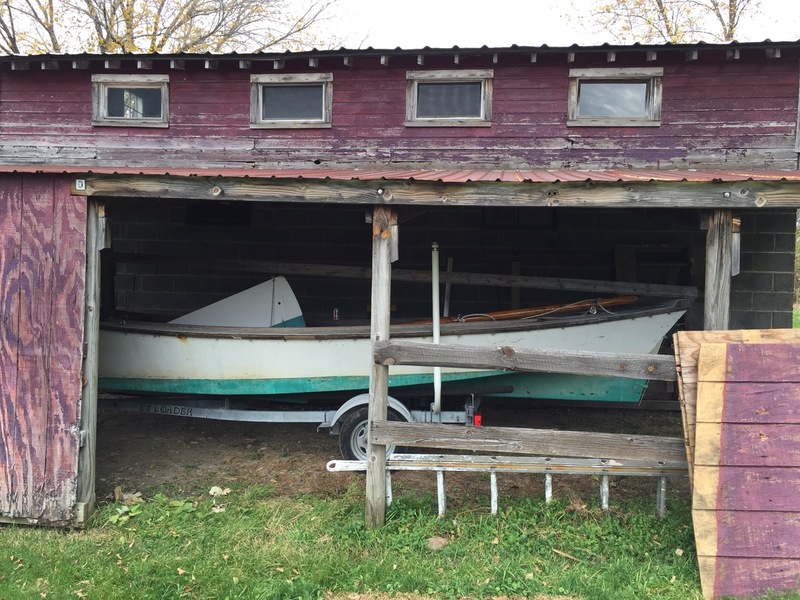 We have enjoyed that process but it was clear that a sailboat was not going to be a very big part of our life. 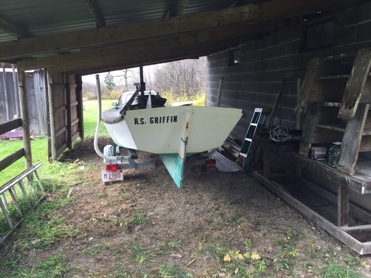 However, I did keep my 20 foot open gaff-rigged Sharpie and a couple of sunfish hulls which I'm intending to use on Lake Cayuga – we are about 5 miles away as the crow flies and near a great launch site. I've included a couple pictures of the Sharpie, it's undercover but woefully low on attention.